My name is Jane Nyokabi Gitau from Gatundu South, Kiambu County. I joined GROOTS Kenya as a community-based caregiver through the Gatundu Mwirutiri Women Initiative, following my participation in a GROOTS Kenya training workshop. After my husband died from TB, I suffered a great deal from stigmatization and rejection from my in-laws and the community. At that time, TB was uncommon and people did not know how to differentiate it from HIV/AIDS; my community mistakenly or unknowingly thought that my husband died from HIV/AIDS. I was blamed for my husband’s death and I almost lost my land to my late husband’s brothers. Since then, I have had an interest in helping the survivors of HIV/AIDS deal with the stigma they face and also in educating the community on how to live with and accept the survivors of HIV/AIDS. This was my motivation for joining with a group of other women and forming the Gatundu Mwirutiri Women Initiative. We received training from GROOTS Kenya as community-based caregivers, which provided us with the necessary information and framework to use in advocating for anti-stigmatization of HIV/AIDS survivors. 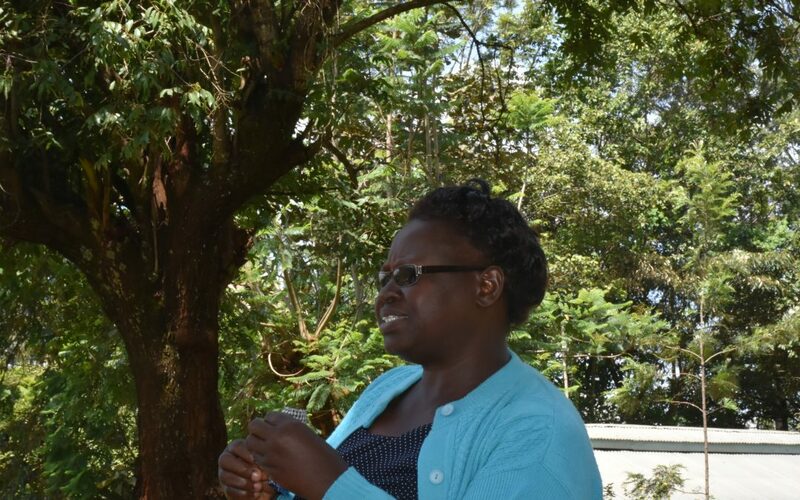 After becoming an active caregiver in 2014, I joined a steering committee that designed the formation of the home-based care alliance and later become the chairperson of the Gatundu District Home Based Care Alliance which has now expanded to all over Kiambu County. As a member of the GROOTS Kenya Gatundu Mwirutiru Women Initiative, we received group level funding from TOWA, 350,000 kes and later 700,000 kes, for conducting behavior change campaigns, counseling and treatment trainings. GROOTS Kenya, as a women empowerment movement, has and continues to impact and improve the lives of women and of needy households through their rigorous empowerment projects and activities which introduce best practices and use of technology. Empowerment of different capacities has seen grassroots women’s involvement in positions of decision making; taking up high profile positions of leadership and establishing transformative change in community leadership in both rural and urban areas. In 2004 and 2005, I was involved in the formation of Community Land and Property Watchdog groups which monitor and safeguards women’s inheritance rights to land and property. We were involved in discussions on drafting the new constitution and were appointed, with others, to create awareness and enhance the implementation of the new constitution in our communities through civic education. We were also appointed to attend a workshop that designed civic education in support of women leadership by UN Women. GROOTS Kenya is geared towards advancing the lives of women and youths through their involvement in the development process. It has given women the support and platforms for them to realize and unleash their potential in both their social and economic lives. This has been achieved through various trainings on different advocacy issues and capacity building through community exchanges. Through the support of GROOTS Kenya, I was able to gain full custody of my late husband’s land and gained the community’s respect. I will always remain grateful to GROOTS Kenya for the support and the exposure they have given me both locally and nationally. GROOTs Kenya has been the root of my success and through them I can fully stand up for my rights and those of other women in my community. Thank you GROOTS Kenya for the love, care and support you have given us. We hope and pray that you will get more donors to support you in transforming the lives of grass root women.